The dramatic part of Yiddish literature has had a less independent development than any other of its parts, and is consequently poorer, both in quality and in quantity. There are probably less than fifty printed Yiddish dramas, and the entire number of written dramas of which there is any record hardly exceeds five hundred. Of these at least nine-tenths are translations or adaptations. The earliest Yiddish dramas originated in Germany. Schudt, in his "Jüd. Merckwürdigkeiten," vi., ch. 35, tells of a troupe of Judæo-German performers in Frankfort-on-the-Main at the beginning of the eighteenth century, of which the director and "regisseur" was Baerman Limburg, author of the drama "Mekirat Yosef" (Sale of Joseph), which was played under his supervision. That drama was published in the above-mentioned city in 1711 (see "Oẓar ha-Sefarim," p. 326), and forms the beginning of the Yiddish drama. Numerous other dramatizations of the story of Joseph, of the Exodus, and of Esther and Ahasuerus were written in the succeeding two centuries; but, with the exception of the Esther plays by Goldfaden and Shaikevich, are of interest to bibliographers only. 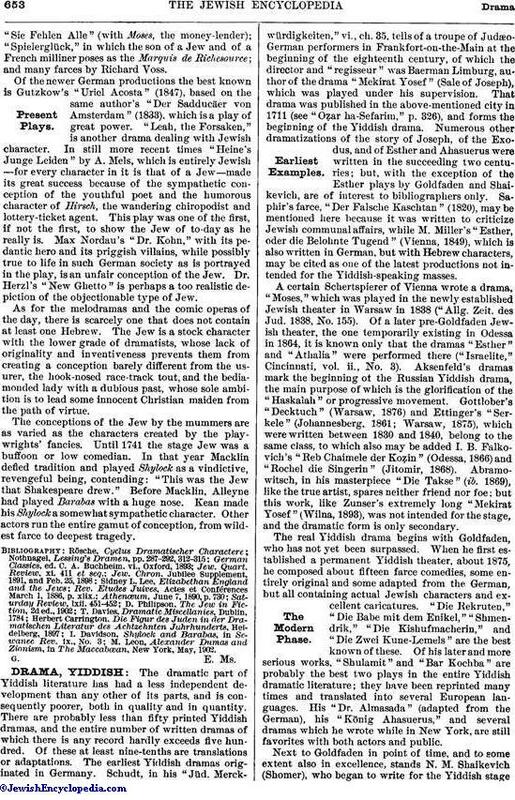 Saphir's farce, "Der Falsche Kaschtan" (1820), may be mentioned here because it was written to criticize Jewish communal affairs, while M. Miller's "Esther, oder die Belohnte Tugend" (Vienna, 1849), which is also written in German, but with Hebrew characters, may be cited as one of the latest productions not intended for the Yiddish-speaking masses. A certain Schertspierer of Vienna wrote a drama, "Moses," which was played in the newly established Jewish theater in Warsaw in 1838 ("Allg. Zeit. des Jud. 1838, No. 155). Of a later pre-Goldfaden Jewish theater, the one temporarily existing in Odessa in 1864, it is known only that the dramas "Esther" and "Athalia" were performed there ("Israelite," Cincinnati, vol. ii., No. 3). Aksenfeld's dramas mark the beginning of the Russian Yiddish drama, the main purpose of which is the glorification of the "Haskalah" or progressive movement. Gottlober's "Decktuch" (Warsaw, 1876) and Ettinger's "Serkele" (Johannesberg, 1861; Warsaw, 1875), which were written between 1830 and 1840, belong to the same class, to which also may be added I. B. Falkovich's "Reb Chaimele der Koẓin" (Odessa, 1866) and "Rochel die Singerin" (Jitomir, 1868). Abramowitsch, in his masterpiece "Die Takse" (ib. 1869), like the true artist, spares neither friend nor foe; but this work, like Zunser's extremely long "Mekirat Yosef" (Wilna, 1893), was not intended for the stage, and the dramatic form is only secondary. The real Yiddish drama begins with Goldfaden, who has not yet been surpassed. When he first established a permanent Yiddish theater, about 1875, he composed about fifteen farce comedies, some entirely original and some adapted from the German, but all containing actual Jewish characters and excellent caricatures. "Die Rekruten," "Die Babe mit dem Enikel," "Shmendrik," "Die Kishufmacherin," and "Die Zwei Kune-Lemels" are the best known of these. Of his later and more serious works, "Shulamit" and "Bar Kochba" are probably the best two plays in the entire Yiddish dramatic literature; they have been reprinted many times and translated into several European languages. His "Dr. Almasada" (adapted from the German), his "König Ahasuerus" and several dramas which he wrote while in New York, are still favorites with both actors and public. Next to Goldfaden in point of time, and to some extent also in excellence, stands N. M. Shaikevich (Shomer), who began to write for the Yiddish stagesoon after it was established. His "Jüdischer Poritz," "Der Revizor" (a parody of Gogol's work of that name), "Der Lebendiger Todter," and "Die Kokete Damen," written about 1879-80, possess considerable merit, and his "Spanische Inquisition" was translated into Spanish and played in Argentina. Another of the earliest writers for the Yiddish stage is Ossip M. Lerner, who, among other translations, has furnished a very good one of Gutzkow's "Uriel Acosta." L. Lewinsohn's "Weibersche Knüplach," which gives a droll description of the scare caused among the Jewish women of a certain community by the prospective repeal of "the ban of R. Gershom" which enjoins monogamy, went through at least three editions (Warsaw, 1877; Wilna, 1881). Epstein's "Geschmissener Apikores" (Warsaw, 1879) and Ulrich Kalmus' "Geschichte fun a Seltenem Berit un a Genarte Chasune" (Warsaw, 1882) are crude, but possess some merit and originality. Katzenellenbogen's "Rashi," Lilienblum's "Discontist," and Mrs. H. E. Abramowich's translation of Lessing's "Die Juden" also belong to this period. The Yiddish theater in London never attained much importance, and like similar theaters in Galicia or in some towns of the United States outside of New York, it depended almost entirely, on dramatic productions composed in Russia and, later, on those composed in New York. 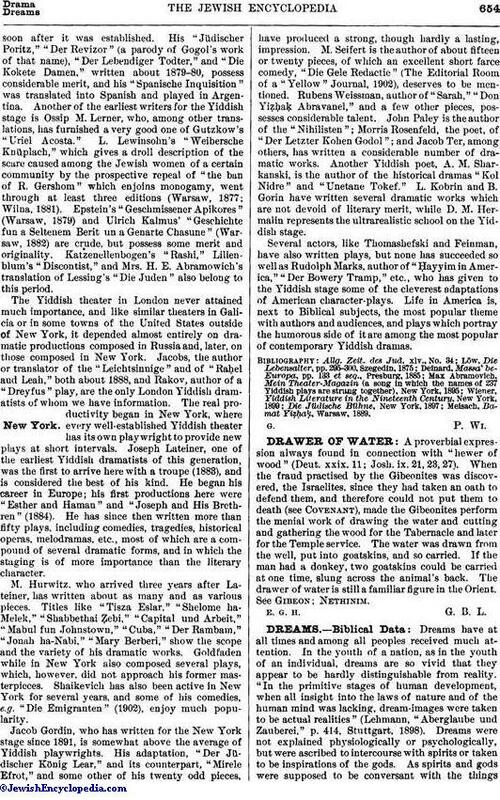 Jacobs, the author or translator of the "Leichtsinnige" and of "Raḥel and Leah," both about 1888, and Rakov, author of a "Dreyfus" play, are the only London Yiddish dramatists of whom we have information. The real productivity began in New York, where every well-established Yiddish theater has its own playwright to provide new plays at short intervals. Joseph Lateiner, one of the earliest Yiddish dramatists of this generation, was the first to arrive here with a troupe (1883), and is considered the best of his kind. He began his career in Europe; his first productions here were "Esther and Haman" and "Joseph and His Brethren" (1894). He has since then written more than fifty plays, including comedies, tragedies, historical operas, melodramas, etc., most of which are a compound of several dramatic forms, and in which the staging is of more importance than the literary character. M. Hurwitz, who arrived three years after Lateiner, has written about as many and as various pieces. Titles like "Tisza Eslar," "Shelome ha-Melek," "Shabbethai Ẓebi," "Capital und Arbeit," "Mabul fun Johnstown," "Cuba," "Der Rambam," "Jonah ha-Nabi," "Mary Berberi," show the scope and the variety of his dramatic works. Goldfaden while in New York also composed several plays, which, however, did not approach his former masterpieces. Shaikevich has also been active in New York for several years, and some of his comedies, e.g. "Die Emigranten" (1902), enjoy much popularity. Jacob Gordin, who has written for the New York stage since 1891, is somewhat above the average of Yiddish playwrights. His adaptation, "Der Jüdischer König Lear," and its counterpart, "Mirele Efrot," and some other of his twenty odd pieces, have produced a strong, though hardly a lasting, impression. M. Seifert is the author of about fifteen or twenty pieces, of which an excellent short farce comedy, "Die Gele Redactie" (The Editorial Room of a "Yellow" Journal, 1902), deserves to be mentioned. Rubens Weissman, author of "Sarah," "Don Yiẓḥaḳ Abravanel," and a few other pieces, possesses considerable talent. John Paley is the author of the "Nihilisten"; Morris Rosenfeld, the poet, of "Der Letzter Kohen Godol"; and Jacob Ter, among others, has written a considerable number of dramatic works. Another Yiddish poet, A. M. Sharkanski, is the author of the historical dramas "Kol Nidre" and "Unetane Tokef." L. Kobrin and B. Gorin have written several dramatic works which are not devoid of literary merit, while D. M. Hermalin represents the ultrarealistic school on the Yiddish stage. Several actors, like Thomashefski and Feinman, have also written plays, but none has succeeded so well as Rudolph Marks, author of "Ḥayyim in America," "Der Bowery Tramp," etc., who has given to the Yiddish stage some of the cleverest adaptations of American character-plays. Life in America is, next to Biblical subjects, the most popular theme with authors and audiences, and plays which portray the humorous side of it are among the most popular of contemporary Yiddish dramas. Meisach, Bamat Yiaẓḥaḳ, Warsaw, 1889.